Some big games were played and we can see Växjö slowly moving to the top. 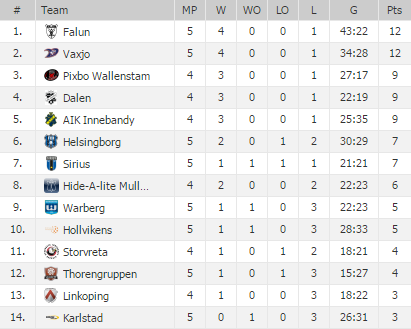 Dalen dropped its game versus Falun and now has 9 points – but also played a game less. AIK is still doing very well and Sirius won a very important game versus Team Thorengruppen. A very tough game that started with a 2-2 draw after the first period. In the beginning of the second period Joakim Olsson scored twice after which his team increased the score to 6-2. A goal by Karlstad reduced the gap to 6-3. The final period saw a comeback of Karlstad who equalized the score to 6-6 with 5 minutes to play. AIK showed resilience and increased to 7-6 with just over 3 minutes to play. Despite a 6 vs 5 powerplay Karlstad didn’t manage to score and had to go home with 0 points and remains the bottom team for now. After every SSL round FloorballToday looks back at the matches played. Make sure to visit FloorballToday regularly to stay up-to-date about the most prestigious league in the world.